Here’s an example of AppleScript’s ability to transfer data between applications, to pour the source material into a newly created document, and to apply multiple formatting procedures to the text flow. In this script example, the contents of an OmniOutliner outline document are transformed into a Pages word-processing document. 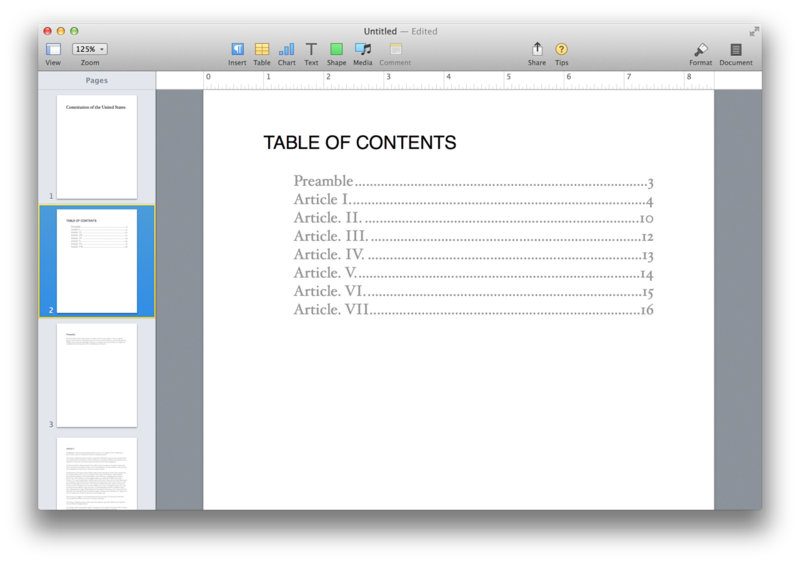 The contents of each outline section become a new section in the Pages document. In addition, the script generates a table of contents for the new document. 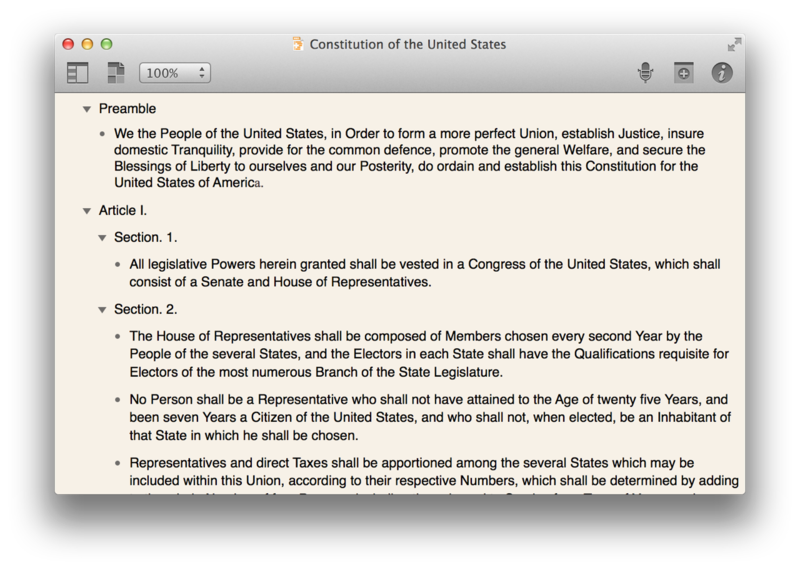 (⬆ see above ) An Omni Outliner document containing the Constitution of the United States in outline format. DO THIS ►DOWNLOAD the example Omni OmniOutliner document. OmniOutliner, from the Omni Group, is available for purchase from the Mac App Store, or as a trial version from the Omni Group website. Download the example file, open and run the script. 01 property defaultTemplateName : "Blank"
04 property defaultDocumentTitleTypeFace : "Hoefler Text"
05 property defaultDocumentTitleTypeColor : "black"
07 property defaultSectionTypeFace : "Times New Roman Italic"
09 property defaultSectionTypeColor : "black"
11 property defaultBodyTypeFace : "Hoefler Text"
13 property defaultBodyTypeColor : "gray"
15 property defaultTOCTitleTypeFace : "Helvetica"
17 property defaultTOCTitleTypeColor : "black"
19 property defaultTOCItemTypeFace : "Hoefler Text"
21 property defaultTOCItemTypeColor : "gray"
52 display alert "INCOMPATIBLE TEMPLATE" message "The template of this document does not have an active document body text flow." 164 set AppleScript's text item delimiters to ""